Denying that genocide is occurring in Western Sudan, canceling debt in Liberia, supporting Ethiopian military forces, and taking actions in Somalia, it seems that the US is shifting its policy in Africa towards a role acting as a military and development aide rather than a imperialist imposer. 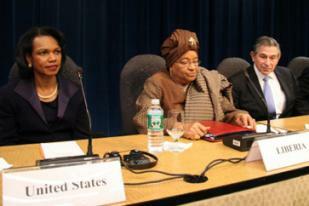 Last week, Condolezza Rice traveled to Liberia to announce the cancellation of Liberia’s debt. To help Liberia recover from conflict $391 million will be dropped. The President has also asked that Congress approve $200 million in additional aid. 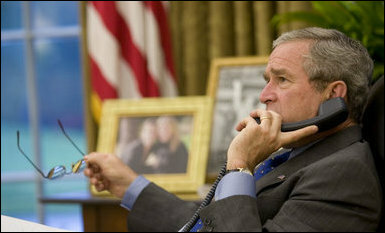 The current debt was called by Paul Wolfowitz, president of the World Bank, to be unacceptable. I see this as yet another step by the US to come up to par with China’s investments in Liberia and Africa. The US is attempting to build strongholds of US influence across the African continent in order to gain influence. Definitely the cancellation of debt for Liberia is key to development as they recover from conflict, but what might be the US motives behind the cancellation. “>US warships are headed to the Somalia coast to engage rebels who have commandeered an aid ship bringing in food supplies. The cargo ship was a UN chartered vessel and was taken over by Somali pirates yesterday. They are unsure if the crew of 12 has been injured. The cargo ship, The Rozen, has delivered over 1,800 tons of food aid and was attacked last year by Somali pirates, but dodged the pirates. The current US military involvement in the Ethiopian and Somali conflict has raised some interesting issues. Is the US working towards pushing anti-terrorism measures in Africa? Is the US pushing for more military aid to developing countries or are they looking to just win over the leaders of countries for economic and political gain? Next Next post: oil to the people?